to organize themselves for fun play. Morning and afternoon childcare is available for the children of parents who need an extended school day. Childcare can be used as needed and does not need to be arranged before hand. We charge $6.00 per hour in fifteen minute increments and we invoice monthly. Mt. Helix Academy’s Activity Center is open each school day at 6:30 a.m. At 7:45 a.m., K-5 students are escorted to the playground until school begins at 8:00 a.m. Middle School students are escorted to the Middle School Annex by a Middle School staff member. After school childcare starts at dismissal and extends to 6:00 p.m. For K-5 students, the first 45 minutes after school consists of a supervised study hall, during which the students can work quietly on their assignments. No prior arrangement is necessary to take advantage of this option. A one-hour study hall, from 3:30 p.m. to 4: 30 p.m., is available to students in our Middle School module. Students are directly supervised by a Middle School teacher in the Middle School Annex and are provided assistance with homework, as needed. No prior arrangement is necessary to take advantage of this option. These study hall options are not designed to serve the needs of all students. Some students need more intensive supervision and coaching to benefit from a study hall. For these students, we provide Homework Club and, for those students who require tutoring in order to understand the subject matter more clearly, we offer Academic Tutoring. Information on both of these options can be obtained by clicking on the “Homework Help • Tutoring” page found in the left-hand column. The Activity Center is the location of our childcare program from 4:00 to 6:00 p.m. 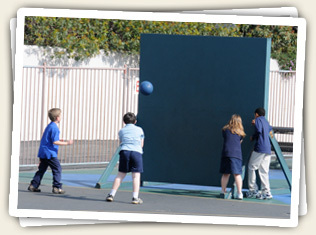 The students are provided a variety of structured and less structured activities, including arts & crafts, computer activities, games, sports, and friendly free play. Horseplay is never permitted in the Activities Center.